2004 Dodge Durango smooth ride, powerful engine. This vehicle is a 4 wheel drive which helps in the winter months when there is snow to get through. With it being an older model I did have to get a few things repaired which included the heat and cooling system. Now that it is fixed it is great because there are systems in the front and rear of the vehicle. This gives optimum heat in the winter and air in the summer for the entire vehicle. The ride in this vehicle is pretty smooth for an SUV but at times you will feel the bumps in the road. I love the power of the Dodge Durango and I would recommend it to anyone who wants an easy drive but powerful ride. This model had leather seats that are ideal for cleanliness. I would definitely purchase a more current model in the future. Amazing bond with a car and its owner. I have the limited 5. 7 hemi edition. Had the rear main seal done, I just found out I am leaking gear oil, a belt had broke on the interstate while traveling, and has a tendency to act weird when it rains has stalled out on me a few times. Besides all the fixable problems I listed, this lovely vehicle has been my dream come true. When you have a bond with your car, you all just chick. And miss doubled and I have. We stay in the woods and she's yet to ever fail me. I wouldn't trade her in for the world. I believe any car can be amazing as long as the driver and car understand each other. 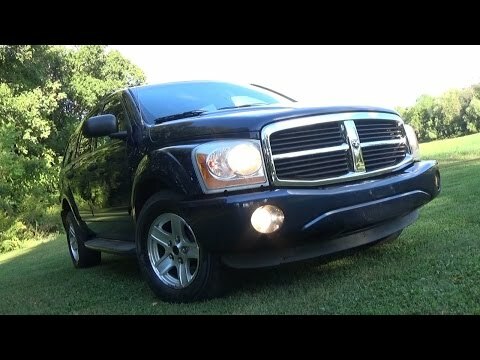 Family vehicle- Dodge Durango 2004. I had to replace the engine twice. Apparently the Dodge. 7 hemi engines had known issues. Otherwise the car has been great. I love that the pedals move which is a great feature for a driver who is short status. I have a third seat and it works wonderfully for my family of five. When the kids were younger, there was plenty of room for two car seats and a double stroller. Now that they are older, the car is very comfortable and fits plenty of their friends and sports equipment. After having the car for 14 years we love it so much we are looking to replace it with a newer version. ON CERTAIN SPORT UTILITY VEHICLES, AN INSTRUMENT CLUSTER CIRCUIT BOARD CAPACITOR MAY OVERHEAT. THIS COULD POTENTIALLY RESULT IN AN INSTRUMENT PANEL FIRE. DEALERS WILL REMOVE THE CAPACITOR FROM THE CIRCUIT BOARD. OWNER NOTIFICATION BEGAN ON DECEMBER 17, 2003. OWNERS SHOULD CONTACT DAIMLERCHRYSLER AT 1-800-992-1997. ON CERTAIN SPORT UTILITY VEHICLES EQUIPPED WITH 3.7L AND 4.7L ENGINES, THE THROTTLE CONTROL CABLE MAY INGEST WATER AND FREEZE DURING EXTENDED COLD TEMPERATURE. THIS COULD CAUSE THE THROTTLE TO STICK IN THE OPEN POSITION AND RESULT IN A CRASH. DEALERS WILL REPLACE THE THROTTLE CONTROL CABLE. OWNER NOTIFICATION BEGAN ON JANUARY 19, 2004. OWNERS SHOULD CONTACT DAIMLERCHRYSLER AT 1-800-853-1403.